This is the description of the TCP/IP protocol for the Brick Daemon and the WIFI/Ethernet Extensions. An overview of products that are controllable over TCP/IP can be found here. The TCP/IP protocol is modeled after the concept of a function call. A request packet is send to the stack to trigger the execution of a function on a selected Brick or Bricklet. Functions that return something send a response packet back containing the return value(s). Functions that return nothing don't send a response packet back to the host. Beside normal functions there are also callbacks. Bricks and Bricklets can send response packets spontaneously back to the host to notify about an event or specific condition. The packet length specifies the length of the complete packet (header and payload) in bytes. A packet without a payload has a packet length of 8. 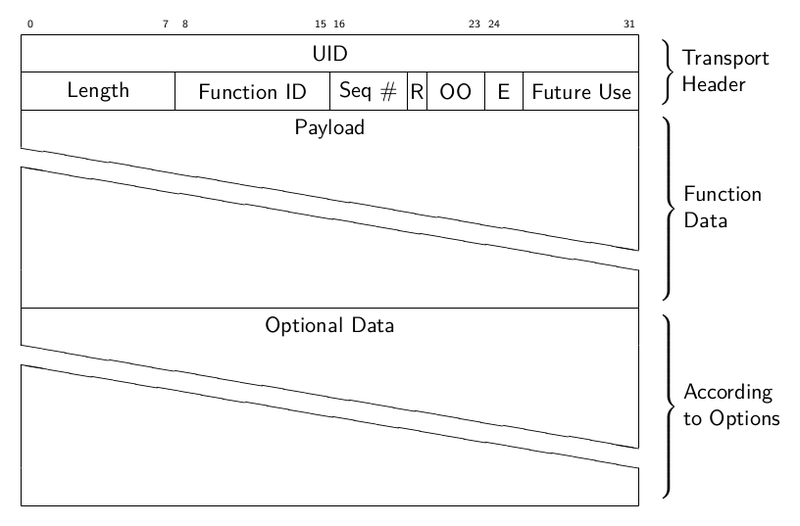 The function ID combined with the transfer direction defines the content of the payload and this determines the packet length. In a request packet the function ID specifies which function to execute on the device specified by the UID. In a response packet the function ID specifies from which function or callback the packet was send. The sequence number is incremented with every packet send. The answer from a Brick/Bricklet has the same sequence number. Since the Bricks/Bricklets currently guarantee that packets are answered in the correct order, this is not strictly needed. However, we can't rule out the possibility that there will be a Brick in the future that has a processor that is capable of real multitasking. For callbacks the sequence number is always 0 and this value is not allowed for other packets. Non-callback packets can only use 1 - 15 as sequence number. This allows to distinguish callback packets from other packets. Response Expected (1 bit): This bit is set to 1, if the packet should be answered. This has two advantages: First, the routing table can be constructed more efficiently, since it is known if there is an answer to a packet or not. Second, it is possible to receive an answer for a "setter". If you call a setter such as setPosition, there is normally no answer from a Brick and the call does not block. This means, that it is possible to spam the Bricks with more messages then they can swallow. With the R flag it is possible to turn blocking setters on. Additionally, the R option can be used together with the E flag, see below. Other Options (3 bit): Three currently unused options, for future use. Error Code (2 bit): This number can be set by a Brick or Bricklet in an answer message to a function call. If it is different from zero it means that an error occurred. Future Use (6 bit): Six possible flags for future use. When the UID of a device is known its specific functions can be called. To do this you need to send a corresponding request packet. The UID specifies the destination of the request packet and also affects the meaning of the function ID. This is because the same function ID has different meanings for different Bricks and Bricklets. For example, function ID 1 maps to the get_stack_voltage function on the Master Brick and to the set_port function on the IO-16 Bricklet. Flags 0 as uint8 (0x00). humidity 421 as uint16 (0xa5 0x01). If there is no device with the given UID then the request is ignored and no response is send at all. This means that you should wait for a response packet only for a certain amount of time. The recommended timeout is 2500ms. After this amount of time you can assume that there is no device with the given UID. There are also specific functions that do not send a response packet under normal conditions, for example the set_state function of the Dual Relay Bricklet (assuming the response expected flag is not set). Devices can send response packets spontaneously back to the host to notify about an event or specific condition. 0000   32 13 78 d8 0e 20 08 00 11 ff 3c 00 21 ff        2.x.. ....<.!. As callbacks are spontaneously triggered you can receive their response packet at any time. For example between sending a request packet and receiving the corresponding response packet. Using callbacks for recurring events is always preferred compared to using getters. It will use less USB bandwidth and the latency will be a lot better, since there is no round-trip time. Support for authentication was added in Brick Daemon version 2.1.0 and Master Brick firmware version 2.2.0 for the Ethernet and WIFI Extensions. With authentication enabled each TCP/IP connection starts in non-authenticated state. Before any normal communication can occur an authentication handshake has to be performed successfully to switch the connection to authenticated state. This handshake uses the server/client nonce approach utilizing HMAC-SHA1. The server side of the handshake is handled by the manager of the TCP/IP connection. This can either be a Brick Daemon or a Master Brick with a Ethernet or WIFI Extension. For this the manager of the TCP/IP connection (the server) got its own UID 2 (1 as integer) so it can receive function calls: get_authentication_nonce and authenticate. Server nonce 0x50 0xc0 0x29 0xd1. Full nonce 0x50 0xc0 0x29 0xd1 0xdc 0x42 0x57 0x4d. Authentication secret My Authentication Secret! of the final nonce. The digest is then send to the server along with the client nonce by calling the authenticate function. The server receives client nonce and digest and does the same calculations as the client did. If the server calculates the same digest as provided by the client then client and server used the same secret. In this case the connection is switched to authenticated state and the client can proceed with normal communication. If the digests don't match the client used a mismatching authentication secret and the server closes the connection. The API is split in several categories. The Brick Daemon functions currently deal with authentication. The broadcast functions are send to all devices and the callbacks are send back by the devices. Support for authentication was added in Brick Daemon version 2.1.0 and Master Brick firmware version 2.2.0 for the Ethernet and WIFI Extensions. Authentication is done per-connection. For this Brick Daemon got its own UID 2 (1 as integer) as the manager of the TCP/IP connection. This is the first function used in the authentication handshake. It asks the manager of the TCP/IP connection for the server authentication nonce. This is the second function used in the authentication handshake. It sends the client nonce and the HMAC-SHA1 digest to the manager of the TCP/IP connection. If the handshake succeeds the connection switches from non-authenticated to authenticated state and communication can continue as normal. If the handshake fails then the connection gets closed. The following functions are supported by all devices. The UID in the packet header has to be set to 1 (0 as integer) for broadcast. Should be send periodically to the WIFI Extenstion to improve the detection of Wi-Fi disconnects. Without this a disconnect of the WIFI Extension might no be detected at all due to the way TCP/IP works. The API bindings send a disconnect probe if there was no other packet send or received for at least 5s. Bricks and Bricklets just ignore this function ID. As this feature is only useful for the WIFI Extension the Brick Daemon just drops incoming packets with this function ID and does not forward them over USB. Triggers the CALLBACK_ENUMERATE callback for all devices currently connected to the Brick Daemon. Use this function to enumerate all connected devices without the need to know their UIDs beforehand. The WIFI Extenstion can send this callback to affect the TCP/IP buffer handling of clients. This can improve the handling of request packets on the client side. This feature is internal and bindings should just drop incoming packets with this function ID. uid: The UID of the device. connected_uid: UID where the device is connected to. For a Bricklet this will be a UID of the Brick where it is connected to. For a Brick it will be the UID of the bottom Master Brick in the stack. For the bottom Master Brick in a stack this will be "0". With this information it is possible to reconstruct the complete network topology. position: For Bricks: '0' - '8' (position in stack). For Bricklets: 'a' - 'd' (position on Brick). hardware_version: Major, minor and release number for hardware version. firmware_version: Major, minor and release number for firmware version. device_identifier: A number that represents the device. 0: Device is available (enumeration triggered by user). 1: Device is newly connected (automatically send by Brick after establishing a communication connection). This indicates that the device has potentially lost its previous configuration and needs to be reconfigured. 2: Device is disconnected (only possible for USB connection). In this case only uid and enumeration_type are valid. It should be possible to implement plug-and-play functionality with this (as is done in Brick Viewer).